The last treatise on the theory of determinants, by T. Muir, revised and enlarged by W. H. Metzler, was published by Dover Publications Inc. in 1960. It is an unabridged and corrected republication of the edition ori- nally published by Longman, Green and Co. in 1933 and contains a preface by Metzler dated 1928. The Table of Contents of this treatise is given in Appendix 13. 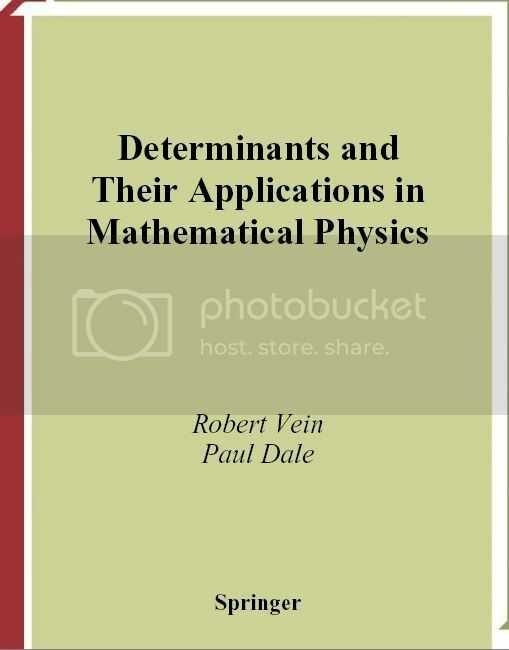 A small number of other books devoted entirely to determinants have been published in English, but they contain little if anything of importance that was not known to Muir and Metzler. A few have appeared in German and Japanese. In contrast, the shelves of every mathematics library groan under the weight of books on linear algebra, some of which contain short chapters on determinants but usually only on those aspects of the subject which are applicable to the chapters on matrices. There appears to be tacit agreement among authorities on linear algebra that determinant theory is important only as a branch of matrix theory. In sections devoted entirely to the establishment of a determinantal relation, many authors de?ne a determinant by ?rst de?ning a matrixM and then adding the words: “Let detM be the determinant of the matrix M” as though determinants have no separate existence. This belief has no basis in history.